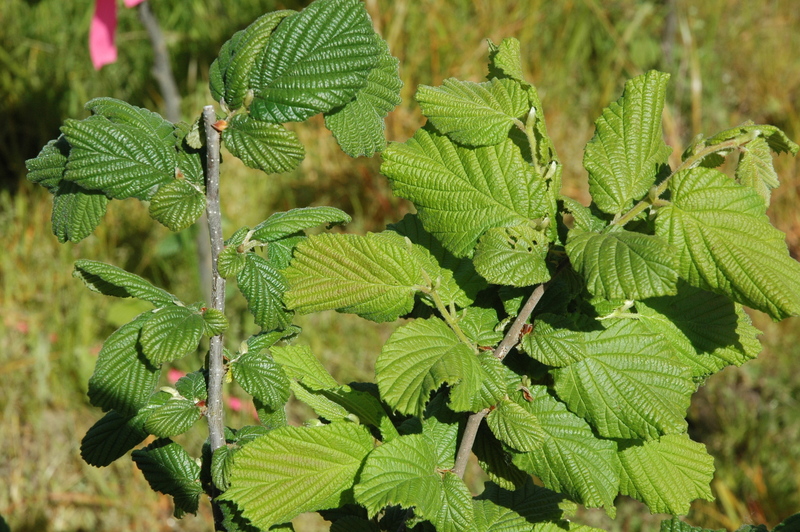 Plant Growth Regulator (PGR) effect on hazelnut from use of a group 3 fungicide. PGR effect results in darker green, smaller leaves and shoots with shorter internodes. 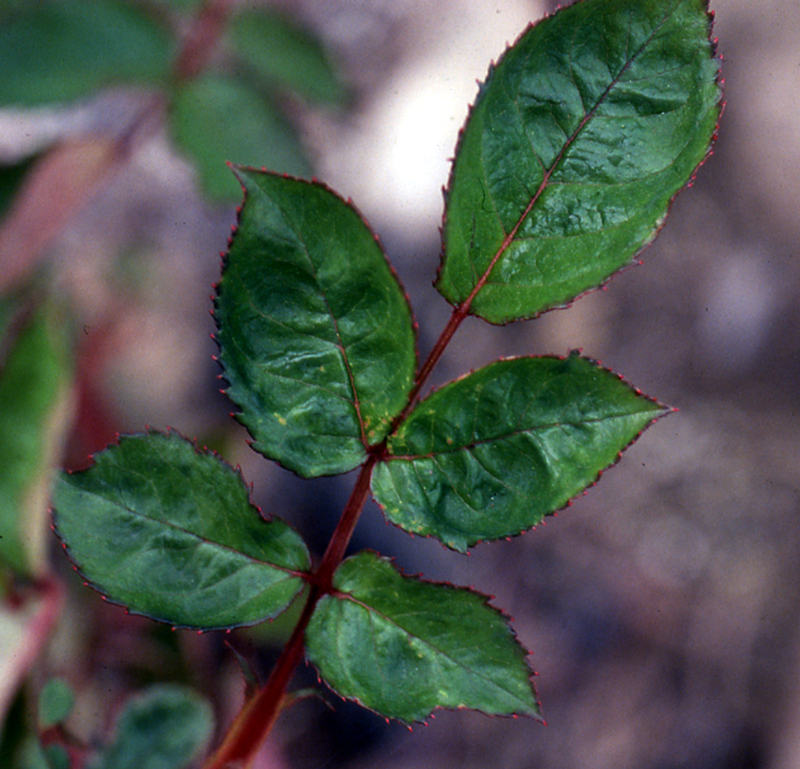 Plant Growth Regulation (PGR) effect on rose due to application of a DMI or group 3 fungicide. This is also referred to as the "draw string" effect due to the puckering of the leaf. Fungicides can be classified by chemical group, general mode of action, specific mode of action, or by physical properties once in the plant. Many fungicides within a group, such as the benzimidazoles (fungicide or FRAC group 1), have the same mode of action against fungi. Often, it is recommended to tank-mix or to alternate fungicides with different modes of action to prevent or delay the buildup of resistant fungi. In general, fungi resistant to one chemical in a group, such as iprodione, also are resistant to all other chemicals in the same group—in this example of FRAC group 2 fungicides, to vinclozolin. A fungicide’s mode of action can be described in general or specific terms. A fungicide with broad-spectrum activity is effective against a large variety of pathogenic fungi. Examples of broad-spectrum fungicides include captan, sulfur, and mancozeb. Some fungicides have a very narrow spectrum of activity; for example, mefenoxam (group 4) is effective only against oomycetes like Phytophthora. Alternatively, a fungicide may affect a broad range of fungi but by only a specific mode of action. For example, thiophanate-methyl (FRAC group1) is useful to control many fungal diseases; it acts by binding to tubulin, thereby blocking mitosis. Another way to describe a fungicide’s mode of action is to say that it is used for protection or as a curative, or as an eradicant. Protectants are applied to healthy plants to prevent fungal spores from germinating or penetrating host tissue. They must be applied before the fungal spore has a chance to infect the plant. New plant tissue that develops after application generally is unprotected. Protectants generally are not effective once the fungus grows into plant tissues. Examples of protectants include mancozeb, coppers, and chlorothalonil. Note: Some formulations of chlorothalonil, such as Bravo, can protect newly developed plant tissues because rain action redistributes the fungicide to other plant parts. Curative materials generally act within the plant and are effective against fungi shortly after penetration. “Kickback activity” and “curative” are interchangeable terms. These materials must be applied within a certain time after infection starts. Materials such as dodine, triflumizole, or myclobutanil have 36-, 72-, and 96-hour curative activity, respectively, against the apple scab fungus. Eradicants can be of two types. Lime sulfur is an eradicant that acts by killing fungi on contact. For example, lime sulfur can be used during the dormant season to kill overwintering fruiting bodies (cleistothecia) of grape powdery mildew. At dormant season rates, it would be phytotoxic to young plant tissues during the growing season. Eradicants such as triadimefon and myclobutanil (both FRAC group 3) have been developed that not only kill powdery mildew colonies but prevent sporulation as well. Many of these compounds also are active against rusts and various leaf-spotting fungi. Many fungicides have systemic properties, which means they are absorbed and translocated by certain plant parts. Most of these fungicides are locally systemic. Green plant tissues such as leaves or shoots absorb the materials (such as group 3 fungicides) and move them short distances within the transpiration stream (generally toward the leaf margin) or between plant cells. The QoI or strobilurin compounds (FRAC group 11) have a slightly different distribution. These compounds move into and through the leaf but do not move as readily in the transpiration stream. This activity has been termed translaminar. Long drying times and warmer temperatures after application favor the uptake of all of these materials. Mefenoxam (FRAC group 4) is a fungicide that can be absorbed by plant roots and translocated throughout the plant. Translocation, however, is only acropetally (upward), with the transpiration stream. The phosphonate fungicides (FRAC group P7) are truly systemic compounds and are translocated both basipetally (downward) and acropetally whether applied to soil, roots, or leaves. A fumigant is a vapor-active chemical used in the gaseous phase to kill microorganisms. Many nematicides are fumigants but kill fungal propagules as well as insects and weed seeds. Some fumigants are effective in the gaseous phase. Both temperature and humidity can influence the activity of these compounds in the vapor phase. Antibiotics are produced by one organism against another. Many of the antibiotics in use today are bactericidal, but some also are fungicidal. Very few have been developed for agriculture since they are so useful against human disease. Some fungicides only inhibit fungi (are fungistatic) rather than kill them (fungicidal). Fungistats must be applied continually over the life of the plant to suppress disease development. For example, mefenoxam will not prevent zoospores from penetrating roots but only inhibits an established Phytophthora infection. Terms used to describe fungicides are not mutually exclusive. For example, dodine is an excellent broad-spectrum, protectant fungicide but also has 36-hour curative activity against apple scab. Most fungicides directly inhibit or kill the target fungus, but phosphonate compounds can act by stimulating host defense mechanisms. Details of its activity in host resistance are poorly understood. These products are in general called plant activators. Although disinfectants such as peroxides are considered good fungicides they are used primarily on inanimate surfaces or within irrigation lines. Some have over-the-plant uses. Unfortunately, they generally have short residual times and are not useful for long-term fungal disease control. Delp, C. J. 1988. Fungicide Resistance in North America. St. Paul, MN: APS Press. Soft cover. Gullino, M.L., Tinivella, F., Garibaldi, A., Kemmitt, G. M., Bacci, L., and Sheppard, B. 2010. Mancozeb: Past, Present, and Future. Plant Disease 94:1076-1087. Meister, R.T., and Sine, C. 2010. MeisterPro Crop Protection Handbook. Vol. 96. Willoughby, OH: Meister Media Worldwide. Thomson, W.T. 2000. Agricultural Chemicals, book IV - Fungicides. Fresno, CA: Thomson Publications. Revised regularly.